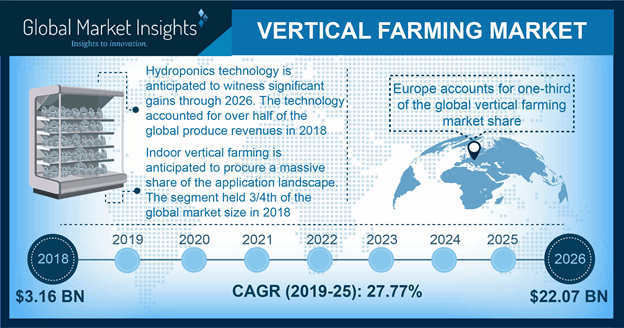 Indoor « Global Market Insights, Inc.
Low availability of land and fluctuating weather conditions will lead vertical farming market to generate a sizable revenue over the next seven years. Of late, the issues of excess population, water conservation, crop production, and recycling have been plaguing the world, on the grounds of which vertical farming has been garnering traction as a feasible solution for these problems. Being the latest phenomenon in urban farming, vertical farming is secured with biosecurity procedures that prevent pest attacks on crops and restrict plant disease. Additionally, there is no concept of seasonal crop or run-offs, which eliminates crop spoilage and transport costs, thereby fueling vertical farming industry expansion. A report by Global Market Insights, Inc., states that vertical farming market size stood at a modest USD 2 billion in 2017. Vertical farming essentially involves plants being grown in vertical layers, stacked one after the other in warehouses, barren lands, deserts, high-rise buildings, and shipping containers. Given that it reduces the necessity of pesticides, sprays, and herbicides in cropping systems and helps farmers deliver their produce on time, vertical farming market is expected to massively proliferate the farming domain in the ensuing years. While outdoor vertical farms are a rather common phenomenon, the concept of farming indoors on account of lack of space in urbane locales has been gaining momentum lately. Basically, indoor farms is inclusive of growing fruits, fish, and vegetables in a controlled environment, such as freight containers, parking spaces, and warehouses. Driven by the fact that this type of farming consumes less water, minimum land, and provides high yield, indoor farming accounted for only slightly lesser than 70% of the overall market share in 2017. Being a massively practiced controlled environment agriculture technique, indoor farming plays a vital role in combating the rising food demand for the ever-increasing populace. Another pivotal advantage of this type of farming is that it is controlled from external adverse climatic changes and thereby lends extra protection to crops. On account of the fact that it helps produce feed in substantially higher quantities without crop damage, vertical farming market size from indoor farming is expected to depict a CAGR of 28% over 2018-2024. Asia Pacific is expected to emerge as one of the most popular regional grounds for vertical farming market, primarily aided by countries such as Singapore and Japan where land scarcity has become an issue of national concern plaguing the country. Other countries such as China, India, South Korea, and Taiwan are also touted to become highly lucrative revenue pockets for APAC vertical farming market. Indeed, APAC accounted for 30% of the overall vertical farming market share in 2017. Powered by changing food patterns, rising population, and lack of arable land, APAC is expected to become the largest vertical farming market in the years to come. for vertical farming in coming years. Japan and Singapore are the major markets for vertical farming and it is expected to rise in future due to rising land scarcity. Prominent players operating in this market often engage in collaborations to enhance crop yield and provide a positive impetus to vertical farming market. For instance, Philips Lighting, one of the global lighting technology leaders, announced last year that it has completed the installation of Philips GreenPower LED Production Modules at Ecobain Gardens, the largest commercial vertical farm operation in Canada. Through this venture of upgrading the previously used lighting in the facility from fluorescent to LED, Philips Lighting aims to help the vertical farming industry major enhance production on a commercial scale, improve growing cycles, and help to grow healthier plants. The move had been touted to save close to CAD 30,000 in energy costs per year. This entry was posted in Sustainable & Smart Technologies and tagged Aeroponics, Aquaponics, Aquatic Species, Bass, Bell, Chili Peppers, Climate Controllers, Crab, Cucumber, Fruits, Global Vertical Farming Market, Herbs, Hydroponics, Indoor, Irrigation Systems, Leafy Greens, Lettuce, Lighting Systems, Meters, Outdoor, Pipes, Pumps, Salmon, Sensors, Solutions, Strawberry, Tanks, Tilapia, Tomato, Trout, U.S. Vertical Farming Market, Vegetables, Vertical Farming Market, Vertical Farming Market Analysis, Vertical Farming Market Report, Vertical Farming Market Research, Vertical Farming Market Share, Vertical Farming Market Size.